For centuries together, folk arts and crafts occupied a conspicuous position in the life of the rural people of Bengal. Though customs, beliefs and rituals varied widely, traditional story-telling, dancing, singing, festivities and ceremonies along with processions and social gatherings were universally prevalent. 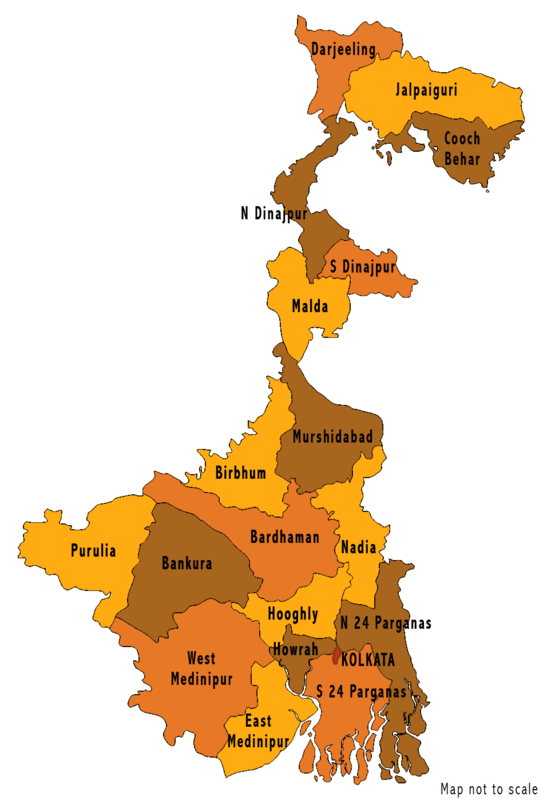 West Bengal was once part of a greater Bengal which included all of Bangladesh and parts of Assam and Tripura in the east and parts of Odisha, Bihar and Jharkhand in the west. Undeterred by man-made borders, the traditional heritage of undivided Bengal continued to exist in West Bengal within ethnic boundaries. Thus most folk forms in the North and East of West Bengal have their roots in present day Bangladesh, while in the west, the tribal centric region once known as Rarh and the eastern part of the Chhota Nagpur plateau share part of its culture with its neighbouring states. With partition and the advent of modernization however, indigenous arts and crafts fell into neglect and artisans began to migrate to cities in search of employment. Many forms died because there was no longer any use of them. For instance, occupational songs that once accompanied manual labour like Chaad Petaano Gaan or Dhaan Kaataar gaan were no longer sung because that particular occupation died out thanks to mechanization. Or a craft that prevailed because of its utility in a rural household died out because of the availability of cheap factory made plastic goods. Moreover, younger generations of communities that are the repositories of our ancient folk traditions, are switching to jobs and professions with greater monetary returns. As a result, many of these traditional arts are disappearing from our cultural landscape – a plight that resonates across the country as a whole. But that is not to say that the entire gamut of folk arts has died. While some have evolved, others have managed to cling on to age old traditions. Where adaption and evolution have taken place, it has been either due to acculturation or in response to globalization, and the changing socio-cultural scene – a phenomenon probably abhorred by cultural purists. But evolution is no stranger to our folk arts – for example, Gambhira often became the target of government wrath during the colonial days because it became a convenient vehicle for people to express their anti-British sentiments. Gambhira still maintains this flexibility of form. The Patuas of Medinipur, reacting to events around them, have in addition to their mythology based scrolls, brought out Patachitras telling their version of the Bangladesh War of 1971 or the Tsunami or the 9/11 horror. When in the early 20th century, famine forced the tribals from the Chhota Nagpur area including Purulia, to migrate to the tea gardens of Assam and North Bengal (and neighbouring coalfields) in hordes, in the hope of better wages, their songs – the Jhumur - expressed their trials, tribulations and misplaced hopes. Perhaps the survival of our folk arts hinges on its ability to cope with and adapt to change, to contemporariness. It is this that will keep it vibrant and alive. Another kind of change has been the result of rural artists being recruited to popularize developmental programmes imposed by the government. The superficial replacement of mythical themes by the theme of birth control, literacy, AIDS prevention - the planning and implementation of which the rural community may have no role whatsoever, is merely a mechanical and possibly , manipulative (feel the purists) use of the artist. These are projects in which he is meant to be a beneficiary rather than a participant. This curtails his autonomy as a people’s artist, fulfilling the cultural needs of his audience. And then again, a new danger lurks: folk art is becoming a marketable commodity today. This is increasingly resulting in a devaluing of many traditional art forms from a way of life to a mere income generating practice. Many arts and artisans are falling prey to this new god in an attempt to survive, and are accepting market driven changes. Part of the reason for this is possibly a lack of awareness on the part of the audience. This portal is an attempt to educate viewers worldwide about the wealth of West Bengal’s folk and tribal culture. We also hope to help them understand the need for preserving these arts as they are, accepting change from within if need be, without imposing any external forces. Click on the map to discover West Bengal’s rich indigenous arts across its districts.